Spanish Circle Time is canceled for Thursday, May 29 because Senora Geiza is away. Spanish Circle Time will resume next Thursday, June 5. Our Caldecott Club program will take place tonight Monday May 12 at 7 p.m. to celebrate the 95th annual Children's Book Week. The Caldecott Club is a great hour-long family book club, where we read picture books together via the big screen. Because today is the start of Children's Book Week, we're going to have a special program, celebrating our favorite winners of the Caldecott Medal. Feel free to bring your own favorites, and we'll try to read as many as we can. We also will serve lemonade and cookies! No registration needed, and all ages are welcome. Come and enjoy some wonderful pre-bedtime reading with your kids! 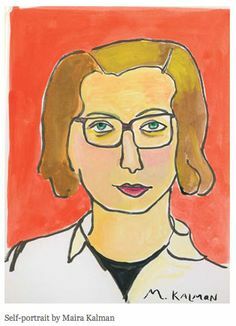 Author/artist Maira Kalman will discuss her newest book, a biography for kids, Thomas Jefferson: Life, Liberty and the Pursuit of Everything " on Saturday, May 10, at 1 p.m. in the Takoma Park Community Center Auditorium. But this is a great event for teens and adults as well! Kalman also is the co-author of a prize-winning book for teens, Why We Broke Up, the author of adult books like "The Pursuit of Happiness," and the illustrator of adult books like Michael Pollan's Food Rules. She's also done covers for The New Yorker magazine and two illustrated blogs for The New York Times . Kalman will sign books after her talk; the books will be provided for purchase by Politics & Prose Bookstore. But the event is free and no purchase is required to attend. Registration is encouraged, but not required. To register, go to: Program Registration - Takoma Park Maryland Library or call us at 301.891.7259. Come to the library tonight at 7:00 and enjoy some bedtime stories and songs! We will have some simple crafts at the end. This program is for young children and their families. Author of the beloved Llama, Llama books, Anna Dewdney, will visit Thursday during the national tour for her new book, Nelly Gnu and Daddy Too. Please register so we will know how many chairs to put out.